Antoinette Charboneau, when we first meet her, is 18 years old, and adviser, counselor and adviser to Duchess Anne of Brittany, who was about to marry the King of France. Antoinette is also "a member of the Sisterhood of the Moon, a priestess of the Great Goddess, the Great Mother. I am a humble servant to the ancient ones, oath-bound to use my healing skills in the name of Blessed Brighid (the goddess of healing)." She even has a moon shaped birthmark on her left forearm. She turns out to be a resolute fighter for her pagan beliefs - as well as proving a passionate lover. Aleta Boudreaux has a degree in Fine Arts from Auburn University in Alabama and for the past twenty-five years, has been studying healing, New Age and Native American philosophy and comparative religions. 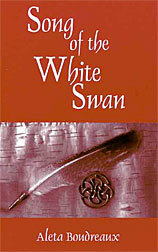 This is what led her to write Song of the White Swan, reviewed below. She is a member of the Theosophical Society in America and the Order of Bards, Ovates and Druids. She says she is "a searcher, a seer and a writer .... I am a student of earth based traditions. I blend what works for me from the Nature Path. I honor Mother Moon, Mother Nature and the Goddess (in all forms)." She lives near the Gulf of Mexico with her family and "is an avid bluewater sailor when the weather is calm". Her husband is a direct descendant of adventurers who came to Nova Scotia in the early 17th century. Song of the White Swan starts in June 1491 and tells how Antoinette Charboneau, a young Druid priestess, is sent on a mission by Anne de Bretagne, the future Queen of France, that takes her across an uncharted ocean to the New World. Set in 15th century Brittany and Nova Scotia, the story also involves a Knights Templar secret mission and an alternative discovery of the New World and its people, the Mi'maq Indians. It begins very well, with realistic descriptions of the growing understanding between Anne and her royal suitor, and her determined opposition to the French king's apparent ally, Cardinal Visconti, and his efforts to establish the power of the Inquisition in her land. It goes on to develop into an exciting well-told tale as Antoinette, disguised as a young sailor, is smuggled aboard a boat that she (wrongly) supposes will take her to England. Apart from an odd vision or two, such as one of a strange bronzed man who beckons her to come to him, she is too busy concealing her identity and getting more and more friendly with the captain, and fighting off the attentions of the first officer, to have much time for more mystical affairs. The captain is truly relieved when he finds out that she is a girl, and it turns out that he even knew her family. But exciting adventures follow when there is a mutiny on board, and he has to set her adrift in a small dinghy which is eventually washed ashore on what is now Nova Scotia, but which was then inhabited by people who behave very much like later Red Indians. One of them is the strange bronzed man she had seen in her vision, who turns out to be called Bear, and it is not long before they fall in love. From this point, the pace slackens, as the story goes all romantic and mystical. The shaman Bear recognises Antoinette as Swan Woman and it is not long before they're starting to make love - but unfortunately, on two occasions, they are interrupted at the very last moment! But he had another problem for Greed had taken "over the lives and minds of both men and women. It made them selfish, turned their hearts dark and their actions malevolent .... Even Bear himself was not untouched by Greed. It had thrown his life into chaos. He could no longer walk between the Worlds or see ten Worlds into the future. Without his power he could not protect his people will find the best food for his tribe". But perhaps Antoinette's Great Goddess can come to the rescue. No, they had reckoned without Sparrowhawk, a malevolent female shaman of a neighbouring tribe whom Bear had taught "words and sacred dances and shared many of the shaman's deepest secrets .... In return she taught him that passionate kisses and ardent caresses were harder to control than a basket full of eels. And twice as dangerous." One of her warriors attempts to kill Bear, but luckily Antoinette can see where he is in a magic vision and sets off to the rescue. When she finds him, "She saw his life energy begin to flow out of his body", so she "held up her hands and silently called on the Goddess to cloak her in an etherial shield of power. Almost at once she was surrounded by a glamour of protection, increasing her visual presence with dramatic waves of golden light and glowing colour." So that was all right, then. It is interesting that these supernatural interventions end up by actually lessening rather than increasing the sense of excitement, as you suspect they are there to provide an easy way out. Even so, Antoinette is reluctant to use her magical powers as she seems to feel that she may use them up too soon - but more magic will be needed if she is to stand up to the evil powers of Sparrowhawk who can, when required, even transorm herself into the form of a vicious hawk. The author's imagination had to work overtime to create whole imaginary worlds, both natural and supernatural, and the result doesn't always carry conviction. She is at her best describing exciting action scenes, particularly those on the boat in the first part of the book, but she also produces vivid, if over- romanticsed, descriptions of Bear and Antoinette's love-making: "Without breaking his flow of kisses, he buried himself in the softness of her flesh. A blinding light exploded behind her eyes and she fell like a shooting star, riding the wind of her lover's passion, moving with him on the pulsing waves of their twinned heartbeats, spiralling upward toward the edge of ecstasy." So the book falls into two parts: before and after the landing in the New World. The promising first part is vividly and realistically described. Although very little is really known about the Mi'maq Indians of Nova Scotia prior to European contact, their way of life is made to sound quite plausible - which is more than can be said for the Druid Sisterhood of the Moon and the Great Goddess. Nevertheless, however implausible all this is, the author does succeed in holding the reader's attention throughout. It's a pity, though that Anne and the dreaded Cardinal Visconti almost disappear from sight. Doubtless they will re-emerge in a later book.They seem so much more real than some of the later whimsies. A sequel to this book, "By Compass and Square", is to be published shortly. There is a page about the author on the Laughing Owl site, but little else on the web. The story begins really well, but the more "mystical" it gets, the more unlikely it all seems.